ceramic products fall under HSN code chapter 69 of GST commodity tariff schedule. The details about GST rate changes for sale of ceramic products are being updated here. The notification changes on exemptions for GST for sale of ceramic products and other circulars related to GST for ceramic products are updated in this website. 1. 6911 Tableware, kitchenware, other household articles and toilet articles, of porcelain or china. 2. 6912 Ceramic tableware, kitchenware, other household articles and toilet articles,other than of porcelain or china [other than Earthen pot and clay lamps]. 2. 6901 Blocks, tiles and other ceramic goods of siliceous fossil meals (for example, kieselguhr, tripolite or diatomite) or of similar siliceous earths. 3. 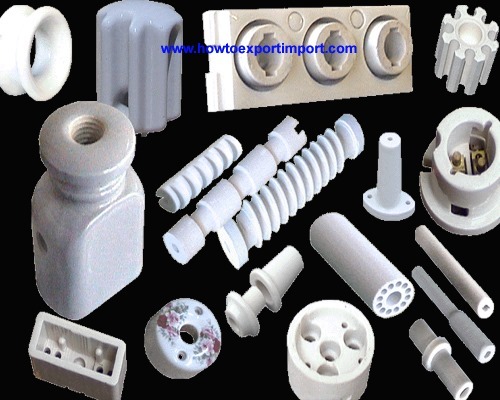 6903 Other refractory ceramic goods (for example, retorts, crucibles, muffles, nozzles, plugs, supports, cupels, tubes, pipes, sheaths and rods), other than those of siliceous fossil meals or of similar siliceous earths. 4. 6904 Ceramic flooring blocks, support or filler tiles and the like. 5. 6905 Chimney-pots, cowls, chimney liners, architectural ornaments and other ceramic constructional goods. 6. 6906 Ceramic pipes, conduits, guttering and pipe fittings. 8. 6908 Glazed ceramic flags and paving, hearth or wall tiles; glazed ceramic mosaic cubes and the like, whether or not on a backing. 9. 6909 Ceramic wares for laboratory, chemical or other technical uses; ceramic troughs, tubs and similar receptacles of a kind used in agriculture; ceramic pots, jars and similar articles of a kind used for the conveyance or packing of goods. 10. 6910 Ceramic sinks, wash basins, wash basin pedestals, baths, bidets, water closet pans, flushing cisterns, urinals and similar sanitary fixtures. towel hooks and toilet paper holders]. 11. 6913 Statuettes and other ornamental ceramic articles. 12. 6914 Other ceramic articles. In Chapter 69,- (i) In the 28% rate column, the entry “6903 Other refractory ceramic goods (for example, retorts, crucibles, muffles, nozzles, plugs, supports, cupels, tubes, pipes, sheaths and rods), other than those of siliceous fossil meals or of similar siliceous earths” may be omitted [This entry is covered in the 18% rate column as all goods of 6903]. (ii) In the 28% rate column, the entry “6908 Glazed ceramic flags and paving, hearth or wall tiles; glazed ceramic mosaic cubes and the like, whether or not on a backing” may be omitted [This tariff heading has been omitted from the Central Excise Tariff with effect from 01.01.2017. This entry is now covered in the entry 6907, which is also in the 28% rate column]. In India, GST is payable for ceramic products. However, some of the categories of business under HSN code 69 are expected to be exempted from paying GST. The list of exempted categories of business and exempted products and services under GST is expected to be released soon. What is the GST rate on ceramic constructional goods? How much GST on ceramic retorts? What is the GST tariff on ceramic washbasins? What is the GST rate on ceramic pots? How much GST on ceramic jars? Krishan : On 22 May 2017 Wall and vitrified tiles in which slab of get? Yashsvi yadav: On 08 August 2017 Sir what is gst and cg gst total tax is what?